Bangalore: The back-office arm of Infosys Technologies Ltd, India’s second largest software services firm, on Thursday said it would pay as much as $58 million (around Rs270 crore) to acquire McCamish Systems Llc, a US business process outsourcing (BPO) firm focused on the US insurance industry. The acquisition, which includes a team of 260 people in Atlanta, Georgia, would help Infosys tap business from US insurance companies that have traditionally been reluctant to outsource work to countries such as India, said an analyst. “It is a strategic fit for Infosys. (But) is it going to help scale up business in thousands (of people) offshore? No. It may be in the hundreds," said Nikhil Rajpal, principal for Everest Group, an outsourcing advisory. US insurance firms have traditionally outsourced software work to Indian firms, but are very conservative on back-office services. ExlService Holdings Inc. is the only offshore back office service provider that has got business from US insurance firms, said Rajpal. The exception, of course is Genpact Ltd which started life as part of General Electric Co. and benefited from captive business the conglomerate’s insurance arm sent its way. Infosys is looking to grow the business by offering so-called platform BPO services which use an underlying proprietary software to deliver services that help delink revenue from the number of people billed. McCamish owns three platforms it has built for its 39 customers. Six of them are common customers of Infosys, but do no business with the company’s back-office services arm. A platform is essentially a process that a back-office service provider creates to cater to one customer and that can then be used to provide similar services to others. “We will have an opportunity to win very large deals in the insurance domain," said Amitabh Chaudhry, chief executive and managing director of Infosys BPO Ltd. “Right now, revenue from platform BPO is less than 1%, we will increase this to 25% in next few years". 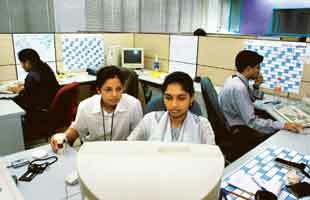 Infosys BPO earned $71 million in the September quarter. Indian IT and back-office service providers are looking to build non-linear business models that delink revenue from the number of people deployed by using technology to deliver services. Tata Consultancy Services Ltd, or TCS, India’s largest IT vendor delivers platform-based BPO services, through its UK subsidiary Diligenta that focuses on the insurance industry. “We believe that no overlap (of McCamish) with Infosys BPO and overlap of only six clients with Infosys IT Services provide good opportunity for cross-selling its services and platform it acquired to its other clients...the acquisition would strengthen non-linearity initiative taken by the company," Shashi Bhusan, IT analyst with Mumbai brokerage Prabhudas Lilladher Pvt. Ltd said in a 12 November note to clients. McCamish Systems, which is not profitable earned revenue of $38.2 million in 2008, Infosys said. Infosys will pay $38 million in cash once the deal is concluded by December, and an additional $20 million based on business performance over three years, Chaudhry said. Infosys shares closed higher by 0.61%, or Rs14, at Rs2,322.70 on the Bombay Stock Exchange on Thursday. The exchange’s benchmark index closed 153.57 points lower at 16,696.